In Boston’s Mattapan neighborhood, the ballot question that would have lifted the cap on the number of charter schools permitted was firmly defeated, 64 percent to 34 percent. 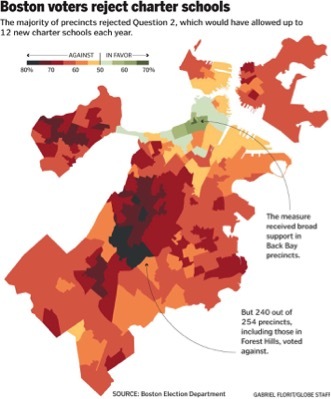 In doing so, the largely black Caribbean neighborhood followed the same path as the other minority neighborhoods in Boston. This is important because proponents of the measure based their arguments on the needs of students of color. This is true even despite the fact that Massachusetts’s charters typically outperform traditional public schools on standardized tests. Moreover, two dozen charter school campuses are sited in low-income neighborhoods with large populations of newcomers and people of color. Michael Curry of the NAACP says, “Communities of color spoke loudly about our needs to protect public school funding while expressing an urgency to deliver a quality education for all.” As readers of the nonprofit newswire may remember, the NAACP took a stand for a moratorium on charter schools earlier this year, as did Black Lives Matter. And, indeed, although the charter proponents outspent the “no” campaign by $9.5 million, the “no” campaign phoned or knocked on the doors of more than twice as many Boston households—378,000 to 150,000. Boston City Councilor Tito Jackson said Tuesday’s results were about “neighborhoods owning the future” of their schools.